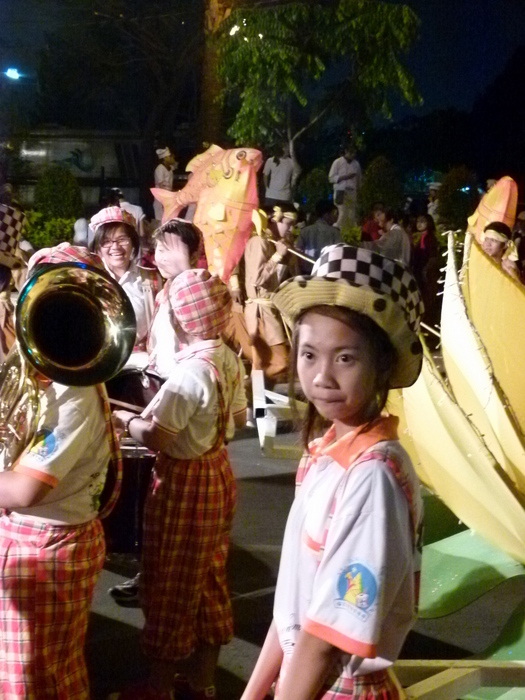 The Vietnamese certainly do love to party and the people of Ho Chi Minh City are no exception. Along with the official holidays there’s also a long list of unofficial celebrations and lots of special festivals throughout the year. Below you can read about some of the main ones and I’ve included some links to where you can find out more. For information on visiting Saigon during TET 2015 click here. ..Many businesses will close during this period, although many of those associated with tourism will remain open. HCMC almost has an eerie feeling in the suburbs with the usually bustling streets shuttered and peaceful. Tet is the first day of spring, also called Hội xuân(spring festival), and is a time of renewal and hope for the coming year. 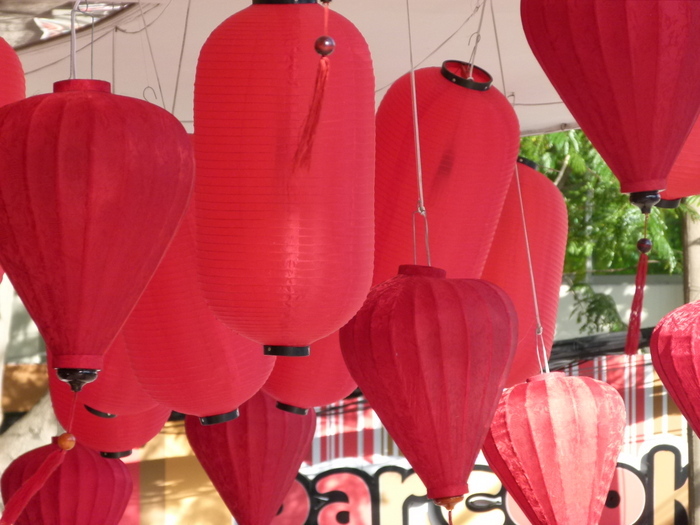 If you are in Vietnam during the TET period you have the opportunity to observe and experience many traditional customs including special foods, firework displays and the giving of “lucky money”, a new VND note in a red envelope, made especially for this purpose. This is of special interest to children although many company executives also give “lucky money” to their employees. 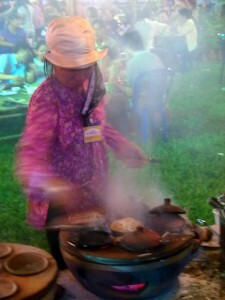 There are a number of other festivals that coincide with TET celebations. Some of the most colourful are the Spring Flower Festivals as detailed below. In Vietnamese history there were 18 Hung kings and on the 10th day of the third Lunar month the people of Vietnam remember and pay tribute to them all. Although widely celebrated in the north of Vietnam, this day is more like a holiday from work for southerners. However, at Suoi Tien Park in District 9, there is a temple constructed for the Hung kings and many come to pray and offer food to the god-like Hung. The temple is in an amusement park so there are lots of other activities you keep you occupied for the rest of the day. Liberation Day is celebrated on April 30 each year and marks the event where the Viet Cong captured Saigon, as it was known then. Naturally many older people from HCMC and those that fled the war to other countries do not see this as a day of celebration. Observed on May 1st in Vietnam to celebrate the International Worker’s Movement. National Day is celebrated on September 2nd and commemorates Vietnam’s declaration of independence from France in 1945. 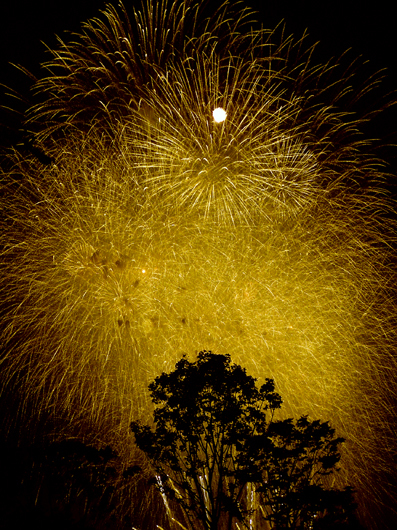 This is a festival in the middle of the year, usually in June. The celbration and offerings are to prevent disease and ward off evil spirits as Vietnamese believe that when the weather changes from spring to summer, it’s easy to become ill. On the day of “killing insects”, every one has to get up early and eat fermented sticky rice and fruits. The main worshipping occurs at noon. Of most interest to visitors to Ho Chi Minh City at this time is the Southern Fruit Festival that coincides with this celebration. See below. Definitely my favorite, Teacher’s Day which is celebrated in Vietnam on November 20th. Students and schools will have various events to show appreciation of teachers who are regarded very highly in the Vietnamese community. 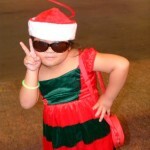 Despite the fact that Christmas Day is not a public holiday in Vietnam you can still get into the festive spirit. Shopping centres put up christmas trees and tinsel and the main area around the Opera House is festooned with bright lights and Christmas Decorations for much of December as is the area around the Palace. 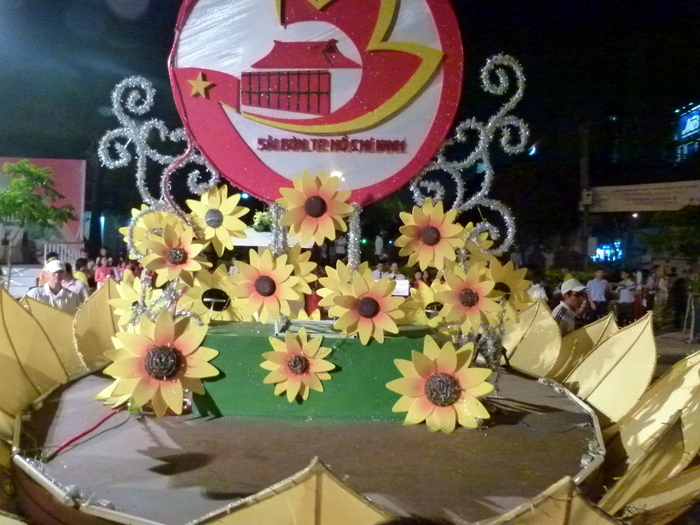 It’s especially lovely to walk around these areas in the evening as families, young and old delight in the festivities. Celebrated on January 1st as per the rest of the world. 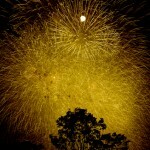 It’s not quite as huge as TET but is celebrated with enthusiasm none the less, especially amongst the Expat community. 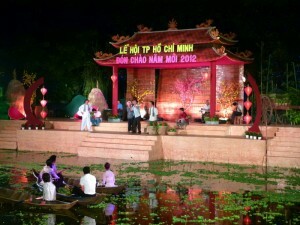 There are at least two Spring Flower festivals worth visiting in Ho Chi Minh City during the TET celebrations. The beautiful Tao Dan Cultural Park on Nyuyen Thi Minh Khai Street, District 1 also holds a Spring Flower Festival that features music, games, food, and of course, flowers. This festival is held just after TET on the 15th day of the first lunar month. 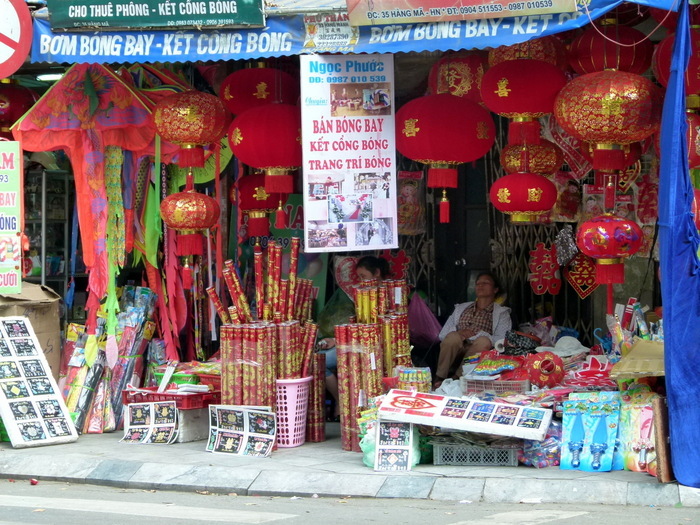 In Ho Chi Minh City it is mainly celebrated by the Chinese community in District 5 (Cho Lon). It is definitely a time of sensory overload with colourful lanterns, lots of drums and displays of arts, crafts and energetic street performances. Families create beautiful lanterns, which are displayed outside for all to see. The lanterns have riddles written on them, and spectators compete to solve these. 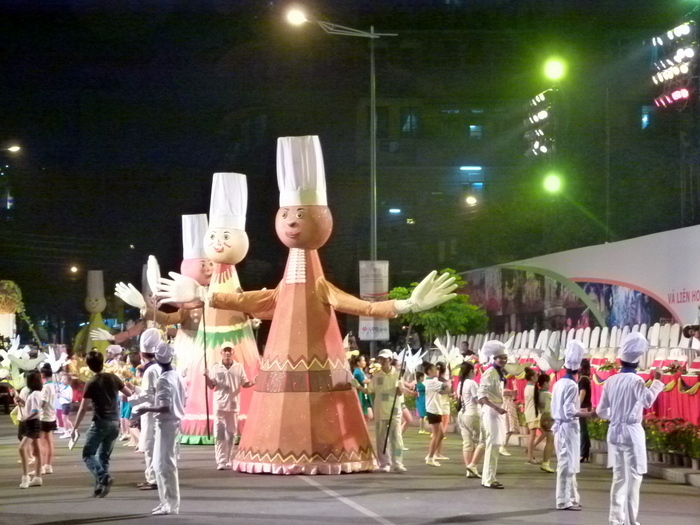 Lantern parades go through the streets of town and down Luong Nhu Hoc Street, which is famous for selling lanterns. Many people will gather in Nguyen Trai, Hai Thuong Lan Ong, Luong Nhu Hoc, and Tran Hung Dao streets to watch the street art performances and a parade of flower cars representing symbols of good wishes such as President Ho Chi Minh, a flying dragon, gold carp, rice flowers and peaches. If you are interested in finding out more about the amazing tropical fruits available here in South East Asia or just want to get some pictures full of colour and activity, check out the Southern Fruit Festival held every year in early June. With over 50 stalls, village arts and crafts, a parade, art performances and exhibitions of village games there’ll be photo opportunities aplenty. It’s conveniently located near the Suoi Tien Amusement Park so you can make a whole day of it. The second most important festival after TET, the Mid Autumn Festival is held on the 15th day of the 8th month in the Chinese Lunar calendar. This normally falls in September or early October. 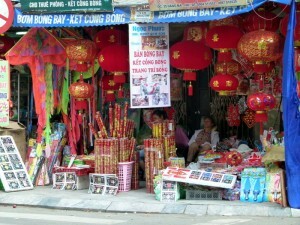 This festival is best observed in District 5, Ho Chi Minh City’s China Town. Of special interest to avid photographers is Luong Nhu Hoc Street that lights up with the glow of colourful lanterns sold in this area. You are also likely to see lion dancing and folk singing contest around this area The festival will be on September 8th in 2014, September 27th in 2015 and September 15 in 2016. 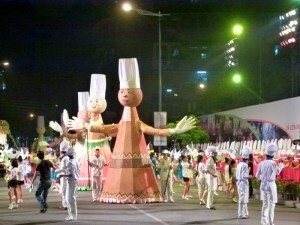 News about other Specialty Festivals and Celebrations can be found Here . Use the filters to narrow down the results.